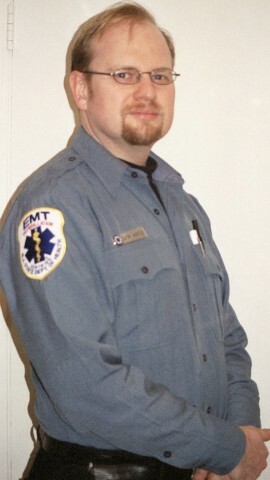 In May, 2003, I joined the Morris Minute Men First Aid Squad. Why? It's something I've wanted to do for a long time, but thought I didn't have the time (or the stomach) for it. I spent the Summer in a 125 hour training course and got my EMT certification in August of that year. Since then I've seen a lot. I respond to an average of 430 calls a year on the Minute Men and I've become the Assistant Captain. I also did a three month stint at the elite University Hospital EMS in Newark, NJ. In a 12-hour shift there each ambulance answers 12-25 calls, making them the busiest ambulances in the US -- probably in the world. These are real calls too. You can count on a shooting and stabbing (or three) most nights in Newark. It's hard work in an exciting and dangerous city. It wasn't a good fit for me (it was too much since I already have a full-time day-job in computers), but if you have the chops, then UH-EMS is an amazing place to work. When you're done working a shift as a university "blue-shirt" you know you earned your pay! A lot of people ask me about working paid versus volunteer EMS. Yes, I can say, they are very different experiences. I would average about 16 911 responses per shift in Newark, vs three at the Minute Men. So you see a lot more and therefore learn a lot more running paid. Newark runs two-person crews and The Minute Men have three or four people in the ambulance. Running calls to homes in suburbia is different then running calls in the projects with gang members and drug dealers all around you. Having a "boss" threaten you if you haven't filled out paperwork completely (there is so much paperwork) or other details really takes some of the fun out of it as well. Doing it every day instead of once a week is exhausting. It is pretty thrilling to get a big check for doing something you've been doing for free. With all that said, the types of calls aren't that different. In suburbia you still get the hairy CHF emergencies, motorcycle crashes, calls to the local jail and frequent flyers who really don't need an ambulance. The only difference in Newark was the higher percentage of assaults, sickle cell, HIV and asthma calls. If you're running on a paid service in suburbia, then you won't even see that. A lot of paid services do non-emergency transport. I've never tried that, and I'm not really interested in it. But it's a large portion of paid EMS and a way to get a check for riding an ambulance. If you like 911 and want to do it as a job, then I'd check out Atlantic Ambulance or Jersey City EMS. I get a lot of email from people asking for tips in taking the EMT class, and passing the exam. For this reason I've created an EMT exam tips web page with just such advice. The Morris Minute Men First Aid Squad is a all-volunteer organization founded in 1941, providing first aid and rescue to Morris Township and Morris Plains, New Jersey (USA). Many patients are surprised to find that no bill comes when the Minute Men take them to the hospital. It's all paid for by donations. The Minute Men is a very busy squad compared to most -- last year there were over 2500 calls taken. The Minute Men do not cover Morristown. The all-volunteer Morristown Ambulance Squad does this. The Minute Men cover the Township of Morris (which surrounds, but does not include Morristown) and Morris Plains. This causes a huge amount of confusion and I blame the US Post Office, since they have people who live in Morris Township address their mail as Morris Plains, Morristown, Convent Station, etc. Most first aid squads are affiliated with a town's fire department. But not all. Some have paid EMTs, and some have volunteers at night, and paid during the day. In my town The Minute Men is not affiliated with the fire department, but is completely independent. EMS (Emergency Medical Services) is divided into two categories -- BLS (Basic Life Support) and ALS (Advanced Life Support). The Minute Men (and most other towns' ambulance squads) provide BLS. If there is a life-threatening situation, then ALS will be dispatched additionally. In my area ALS is provided by paid paramedics (EMT-P) that are based at local hospitals. They drive an SUV called an MICU (Mobile Intensive Care Unit) and do not transport patients. They bill the patient (or their insurance company) for their services. And those services aren't cheap. They will typically treat a patient in their home or the back of our ambulance by setting up an IV, taking blood samples for the hospital, administering drugs, etc, all with the guidance of a doctor over the phone. The concept is that they bring the Intensive Care Unit to the patient. Once they've stabilized the person, then we will transport them, often one paramedic rides with us, while the other one drives their MICU back. A typical crew for an ambulance is 2-4 people. There needs to be a certified driver in the front and a certified EMT in the back, for patient care. It's easier if there are three crew members, so there is someone to fill out the paperwork, hold a dressing in place on a bleeding wound, turn on oxygen, bring a backboard from the ambulance to the house, etc. Since there are often new members who are still learning, it's common to have one or two of them riding along to get real-world experience while they are working on their EMT certification. Any more than 4 people makes the ambulance too crowded, especially if there are paramedics riding to the hospital with us. The minimum age to join the Minute Men is 16. Members younger than 18 are "cadets." They are not eligible to become nationally certified EMTs until they turn 18, but they can get NJ certification. Many members of the Minute Men are High School or College students. Every week Minute Men members are required to do one 12-hour duty shift (6pm-6am) during a weeknight, and once a month a 24-hour shift during a weekend. There are men's and women's bunk rooms and a large living room with a big-screen TV as well as a kitchenette. It's a friendly place where plenty of people not on duty hang out to socialize. On a 12-hour shift there are typically 1-3 calls, although anything is possible. There is also a group of people called the Day Team that handles calls during the day, usually travelling from their home to the building when a call comes. The call type varies. Many are for the two nursing homes in the area. Many are other medical calls (as opposed to trauma calls). There aren't too many car crashes, but they do happen. In the nice weather there's a fair number of sports injuries. The Minute Men also have a rescue truck. This vehicle carries extrication devices like the Jaws of Life, as well as equipment for incidents with many injuries (like a bus accident or a fire). We practice by tearing up old cars in the parking lot. The EMT certification class is taught at a variety of locations. They have classes offered in the day or the evening. The class costs about $650, but if you're a member of a volunteer squad, then the state will pay for you to attend. The total classroom time is 125 hours. There are tests and homework throughout and at the end there are exams on practical skills (splinting, CPR, backboarding, childbirth, etc. ), and the written National Registry Exam. You must pass with a 70% or higher to become an EMT, although you may retest if you fail. Oh. And you have to take a "CPR for Healthcare Providers" class before you can take an EMT class. This is not the same as a regular CPR course. After you become an EMT you must take classes occasionally to keep your certification current. The Minute Men offer one evening class a month which usually counts towards that requirement. There are many interesting courses that will help you to refresh and develop your skills. For instance a 3-day trauma class teaches excellent information beyond the EMT class. The state will also pay for these if you are an active member of a volunteer squad. There is a class on driving an ambulance called CEVO (Coaching the Emergency Vehicle Operator). Some squads require you to take this before driving. The Minute Men have their own curriculum that involves three levels, each with a certain number of trips, first non-emergency, then emergency, then with a patient. In between each level there is a written and on-the-road test. Many of my colleagues when I took my EMT class (in Secaucus) were doing this as vocational training. Most EMTs take their classes at the nearby Morris County Fire Fighters and Police Training Acadmey, and will encounter more volunteers. Being a paid EMT is not a way to become rich, but people do earn a living at it. Paramedic training is over 1000 hours, and offered as a Associates Degree program at some county colleges. You must be an EMT first, and after taking classes you have to ride as a trainee for a while before becoming a Paramedic. Paramedics make significantly more money (still not reasonable for the value and stress of the job). EMS is fun and exciting. In fact it's addictive. If you've ever considered doing it, then you should give it a try. Local volunteer first aid squads are always short-handed. BLS is not rocket-science, and it's not being a doctor or a nurse -- you don't diagnose. You learn a reasonable number of skills, then you go out in your community and use them to help people. You don't "save a life" very often. But you definitely make people feel better when they're having a bad day. They can't thank you enough. It's a real high. If you crave a little excitement, and a lot of personal satisfaction from helping people, then EMS is for you. And once in a while ... you may save a life too. Knights of Life motorcycle EMT riding club. History and explanation of the "Star of Life" EMS symbol. Did you pass? The page where you can check if you passed your national EMT exam. So you want to become a NJ paramedic? Here are some programs. Into the Breach An intense book that tells cool EMS war stories from the front lines in Newark, NJ. Ambulance Girl A terrific new book by a columnist for Gormet magazine that details her experiences of becoming an EMT in Connecticut. I Am Not an Ambulance Driver. Look under books. This is a great series of cartoons about the EMS field! Roberts EMS. A great catalog for EMS stuff, including nice name badges. Galls equipment and apparel. The popular brand.